QuikRead go CRP+Hb, 50 stk. C-reactive protein (CRP) test is used to detect inflammation. CRP is an acute phase reactant, a protein formed in the liver and released to the blood within a few hours of tissue damage, the onset of an infection or other cause of inflammation. CRP test is not diagnostic but a support in the clinical situation. 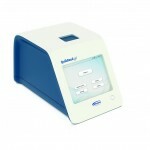 QuikRead go CRP is a quick and easy test for quantitative measurement of CRP (C-reactive protein) in whole blood, serum and plasma with the QuikRead go instrument. TThe esten provides reliable results within 2 minutes and can effectively guide to any treatment with antibiotics.